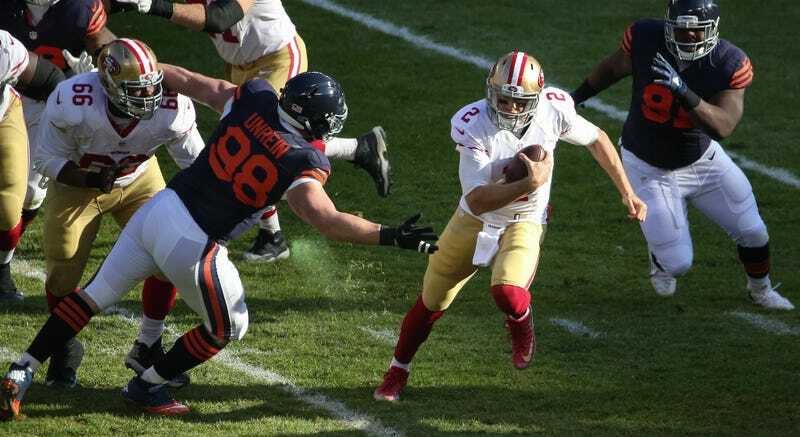 Blaine Gabbert, Jim Tomsula, and the San Francisco 49ers went to Chicago and beat the Bears 26-20 in overtime. It was a silly game between mediocre teams, and as such, it was full of highlights. In overtime, the Niners kept their momentum going, as Gabbert tossed a 71-yarder to a wide open Torrey Smith. At 4-8, this season is probably lost for the 49ers, but they can at least build up some positive momentum heading into next year. If Gabbert continues to play like this, he’ll make Jim Tomsula and Jed York’s jobs easier. San Francisco reportedly met with Colin Kaepernick today and both sides were amenable to sticking together going forward. Whether this is politicking to increase SF’s trade leverage or genuine, Gabbert has easily earned the job for the time being. His record as a starter is bad, but Jim Tomsula trusts him, which is more than you can say for Kaepernick.